400 x 8 4ply trailer tyre with 4 stud 4" PCD wheel rim. 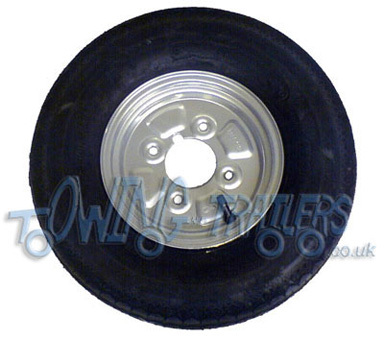 Navigation - Towing and trailers Ltd for Trailer parts : Trailer parts : Wheels and tyres : Wheels and tyres complete : 8 inch : 400 x 8 4ply trailer tyre with 4 stud 4" PCD wheel rim. Wheel size :- 2.5J x 8"
This wheel is Ideal for suspension units up to 500kg standard length with 4" PCD on trailers as it is cheap has the correct offset and a pair will carry 530kg. For more information about trailer wheels and tyres you can view our information pages using the links listed below. If this is not the tyre you require use the links below to find the one you want.